To purchase Michael Black Merlot please click HERE to create an account or log in to My Account if you already have one. Napa native Michael Black has been a respected viticultralist and vineyard engineer for over 40 years. His resume includes planting many high profile vineyards in both Napa Valley and Sonoma County. In 1987 Michael decided to plant a vineyard on the rocky hillside surrounding his house. Located in Coombsville, the vineyard benefits from the two defining characteristics of the region: cool, marine influenced air and volcanic, well-drained soils. To give the vineyard a personal touch, Michael propagated his own Merlot clone that he named the “Black” Clone. The desired characteristics were small berries set in small clusters, all the better to concentrate the structure and complexity of the fruit. 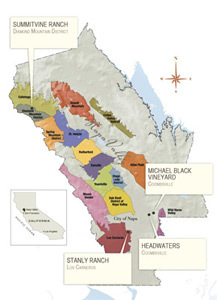 In 2004 COHO was privileged to become associated with the Michael Black Vineyard and began to purchase the entire output. The wines reveal a richness and depth of flavor that is most often associated with the Merlot based wines from the Pomerol region of Bordeaux. Our fans often say “this is a Cabernet lovers Merlot”.